The question of who Hyde Park will choose for president is in serious contention for the least dramatic storyline on a very dramatic election day. The question of who Hyde Park will choose for president is in serious contention for the least dramatic storyline on a very dramatic election day. Illinois will almost certainly opt for Hillary Clinton; Hyde Park will also do so, by an even higher margin (the Senatorial contest isn’t looking to be competitive either—for down-ballot information, see our ballot preview, which starts on the front page). These maps include precincts from the Fourth, Fifth and 20th Wards, including Hyde Park, Kenwood, the very northern portions of Woodlawn. The map from 2008 looks different, since Chicago’s wards have been redrawn since that election. Precinct level results came from the Chicago Board of Elections. In Hyde Park’s Republican bastions, Romney sometimes registered as much as 11 percent of the vote. That was the highest result for Romney among the precincts included on these maps in 2012, in the 27th precinct of the Fourth Ward, which includes most of the quad. (No matter how much time you spend in the Reg, you won’t be registered to vote there, so the precinct’s voting population is presumably concentrated in the upscale blocks west of campus and in Snell-Hitchcock and Max P). 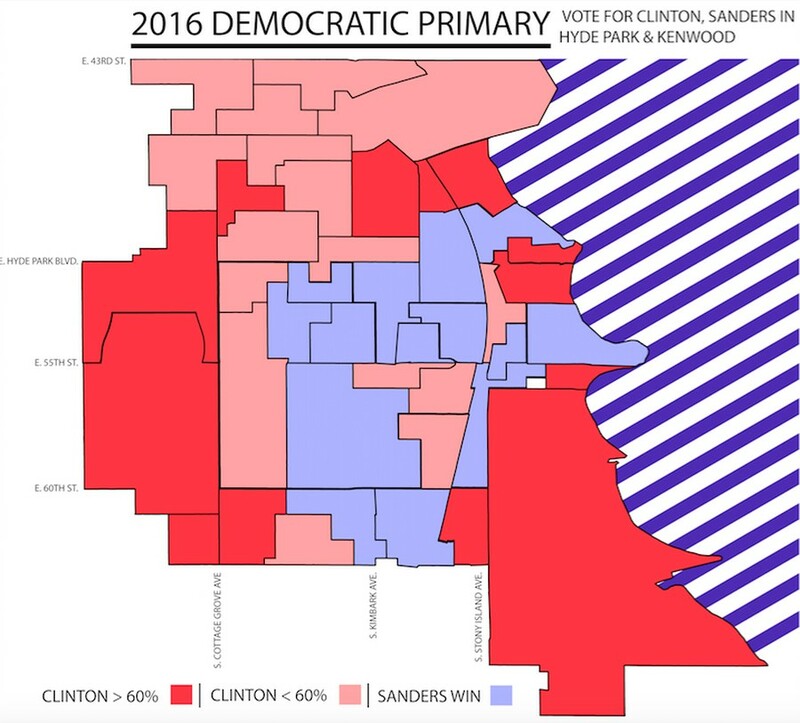 Perhaps not surprisingly, precincts closest to Bernie Sanders’s alma mater also provided his Hyde Park majorities. 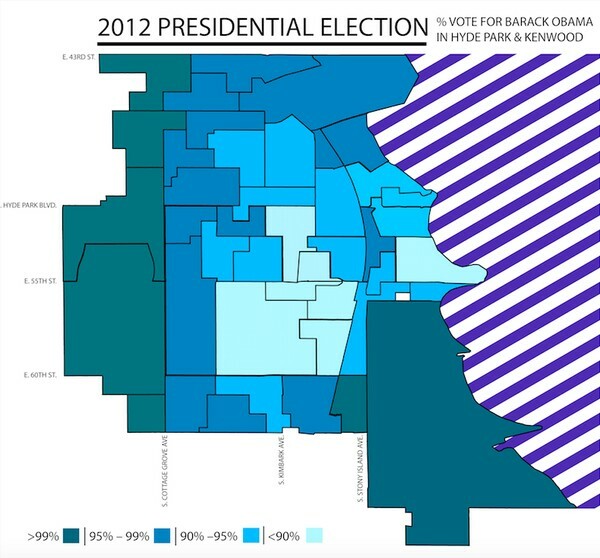 Breaking down returns by precinct in Hyde Park and Kenwood in the 2008 and 2012 general elections and the 2016 Democratic primary reveals some interesting patterns. Specifically, results seem to be somewhat different in precincts closer to the University. More than 99 percent of votes in the precincts on the fringes of Hyde Park and Kenwood voted for Obama (some precincts did not register a single vote for another candidate in 2008). The result of 2008's presidential election. What does this mean for today’s election? As foreshadowed above, more or less nothing, though it's interesting to consider whether an election without Hyde Park’s favorite son on the ballot—but with a, let’s say, exceptional Republican candidate—will see the Republican ticket break 10 or even 5 percent in any Hyde Park precinct.